Built As A Clean Street Hopper, Jayson's Monte Is Now A Well-Loved Regular On The Southeast Picnic Circuit. 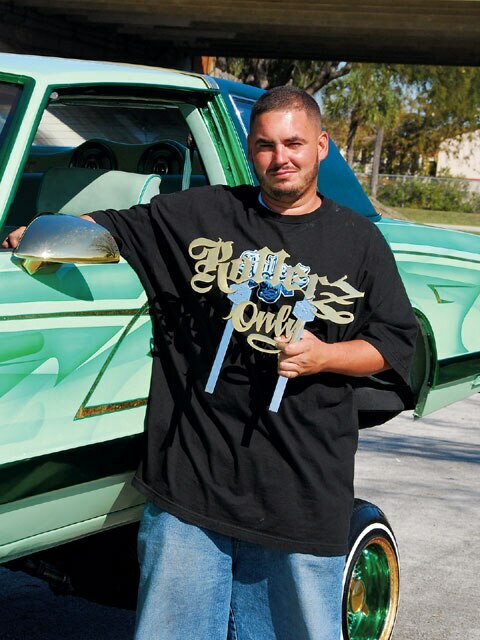 Jayson Villarejo from Hialeah, Florida, grew up on the lowrider circuit, competing first with his model cars and bicycles, then with his ’86 Buick Regal, and now with his latest show entry, a street-hoppin’ ’86 Chevy Monte Carlo. Jayson loves the sport and if you knew him, you’d definitely describe him as a hard-core lowrider. His latest project began when he discovered the Monte parked in the yard of one of his friends who wasn’t planning to customize it. Jayson bought the car and proceeded to make it his own. Originally the factory white car was just going to be cleaned up and used as a driver, but it didn’t take Jayson long to remember that “stock stinks”! With the help of his brother Michael, and his friends Marcus and “Chicho,” the car was transformed into a solid show circuit competitor. Jayson calls Chicho the “mastermind” behind the process and the reason why the car is as elaborate as it is. Their estimate of a one-month project turned into five months as they kept busy, improving the car at every turn. Much of the time was devoted to reinforcing the basics in order to prepare the car for its street-performer role. Changes to the chassis and suspension concentrated on making the car as reliable as it was outrageous. The body of the ’86 was updated with an ’88 front clip, rocker panels, rear bumper and rear taillights to achieve a more Euro-looking style. Then the panels were brought back to like-new condition with Chicho handling the spray gun. The factory-style interior was accented with gold leaf and multiple shades of green, along with an eight-speaker, 1,200-watt stereo. 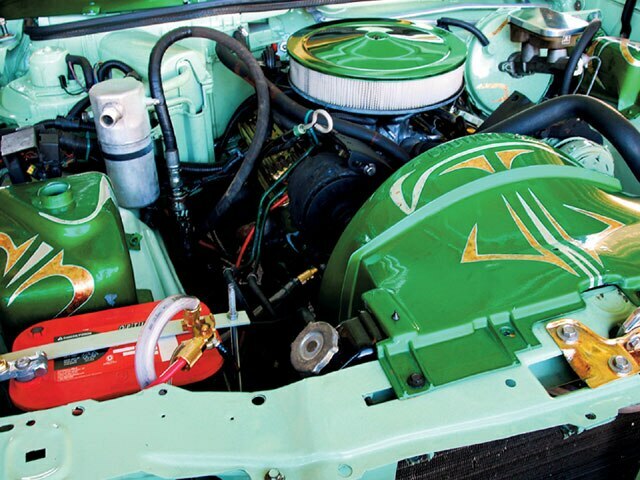 Under the hood, the 4.3-liter V-6 was accessorized with gold plating, anodizing and multiple shades of green to match the exterior. Traditional 13×7 Player 100-spoke wheels follow the classic theme. The team completed the car in five months with Jayson proud to say that this hand-built trophy-winner never left the backyard during the construction period. Special thanks go to Jayson’s family, Marcus, Mike, “Crispy” and especially Chicho for making “Most Hated” such a loveable lowrider. Engine/Drivetrain: Under the hood is a detailed 4.3-liter, fuel-injected V-6/350 Turbo trans combination, accented with anodizing and gold plating. Body/Paint: The body of the ’86 was updated with an ’88 front clip, rocker panels, rear bumper and rear taillights. The base color is custom-mixed PPG Mint Green pearl accented with House of Kolor Limetime pearl, Planet Green and gold leaf. 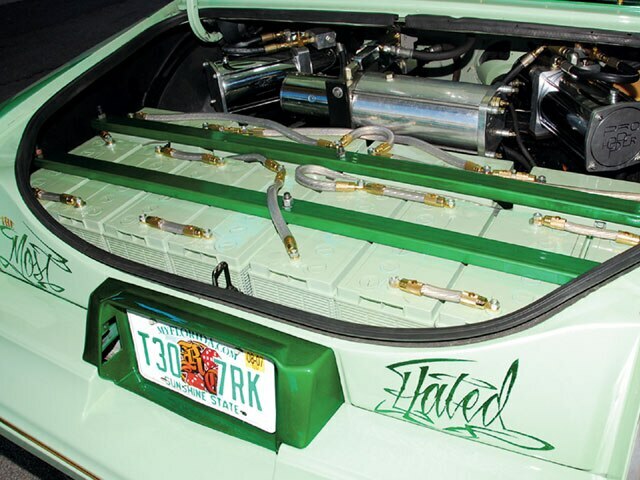 “Chicho” of Miami, Florida, handled the graphic applications of these paints and Mike of Orlando, Florida, added pinstriping. The forest green vinyl top blends in perfectly. 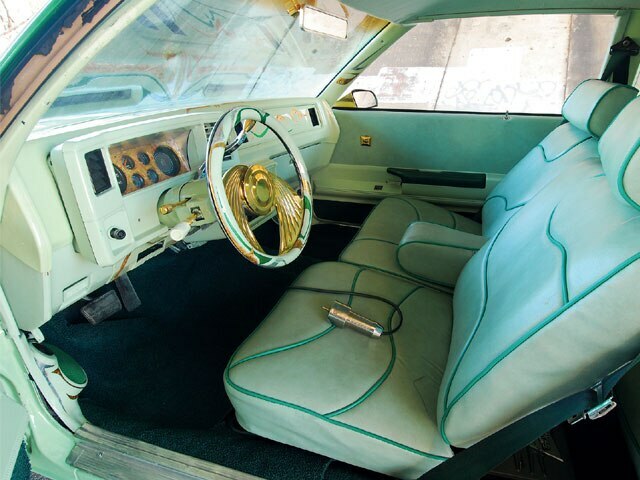 Interior: Chicho and “Fat Boy” teamed up on the mint and dark green upholstery. A uniquely customized steering wheel with a combination of green and gold accents wrap up the interior changes. Sound System: Jordan of Miami installed the stereo with a Pioneer head unit, adding a pair of 12-inch Kicker subs for booming bass along with a custom fiberglass box in the rear package tray holding four 6.5-inch component sets. Additional component sets were added to the kick panels and, just for fun, twin Alpine monitors face out to entertain the crowd. Setup: A three-pump Pro Hopper setup runs one piston pump to the front with an Adex dump and two regular competition pumps to the rear, while 12 Deka batteries with gold leafed connections energize the system. This combination hooked up by Chicho, Marcus and Mike has already sent the Monte to 55 inches. As for the suspension, the trailing arm shackles were dropped and extended, 14-inch CCE struts were installed for lots of lift, the front spindles were reworked with the upper A-arms extended 3 inches, the lower A-arms were reinforced, and 3.5-ton springs were added up front with 3-ton springs controlling the rear. All of the stress points on the chassis were strengthened with 0.25-inch steel.